Excuse me…is it my turn? Are they ready? Oh, hello, my deers…I mean, my dears! 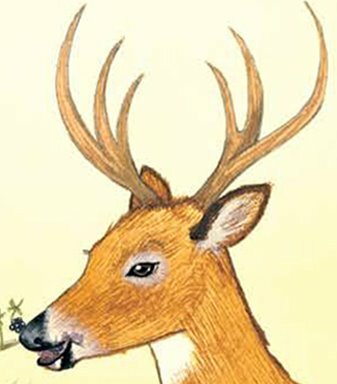 I’m Deer, the quiet one of the group, you could say. Certainly, the most refined. You have no idea how difficult it can be to keep up with all those rascally little forest creatures. I’m constantly having to watch where I step for fear one will scoot right under my hoof! But alas, I digress. When Terry asked me to share my favorite way of eating berries, other than straight off the bush, I knew without a doubt that I would give away my family recipe for the berry best salad you’ll ever taste. This recipe goes all the way back to my great-great-grandmother, who, as the tale goes, had a fleeting cameo role in the movie, Bambi. And this dish is so simple to put together that even a human can do it. So, without further ado, I give you, Deer’s Berry Best Salad. 1. Cut the strawberries in half. 2. Gently mix together all of the berries. 3. Make the dressing by stirring together the rest of the ingredients. 4. Serve the dressing with the salad. 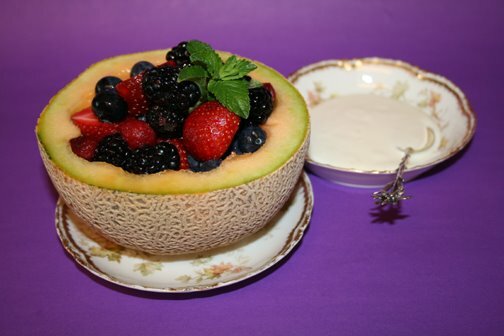 For a fun twist, serve in a halved and scooped out cantaloupe! Let the flavors leap and dance in your mouth!